The true "Mount Edith" referenced in Rocky Mountains of Canada South is the subpeak of a higher unnamed peak just to the north. This can be proven by looking at the height 8380 feet, which comes from the spot height on the 1:50,000 map. There is no spot height on the higher unnamed peak. 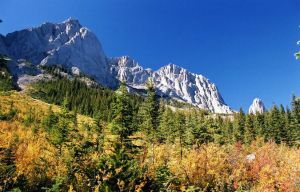 The fact that the subpeak is officially named and not the main peak is similar to Mount Louis and Mount Fifi, both of which have higher unamed parent peaks nearby. Edith is a limestone triple summit. The east and north faces are steep walls of good limestone while the west and south faces are craggier and broken. All peaks provide challenging and moderate to difficult scramble-climbs via their standard routes, and there are a few superb rock routes on the east and north sides. Good information on routes on Edith can be found in Selected Scrambles.. and Selected Alpine Climbs.. respectively. Name Notes: It was named in 1886 after Edith Orde who was an assistant to Lady Agnes Macdonald, the wife of Canada's first prime minister.